I think that most folks who bash holidays do so in poor taste, but I just can’t seem to help myself when it comes to Valentine’s Day. Some astute consumers understand that Valentine’s Day is nothing more than a holiday designed to benefit companies that produce candy, cards, floral arrangements, and teddy bears priced at $182,550. However, there are still many others who are about to break their wallet’s heart when February 14 rolls around. According to a report from the National Retail Federation, the expectation is that consumers in the U.S. will spend an average of $143.56 on Valentine’s Day gifts this year. This represents a year-over-year increase of more than 5%. When all is said and done, U.S. consumers will spend a total of $19.6 billion, which is a nearly 8% increase when compared to the year-ago level. This is the second-highest rate of Valentine’s Day spending in the report’s 15-year history. When we break the spending down into relationship categories, we find that folks are likely to spend an average of $88.98 on Valentine’s Day products for their significant other or spouse. For other family members such as children or parents, the expected average rate of spending per person is $25.29. I guess these estimates probably shouldn’t come as a big surprise, but one interesting statistic stands out: pets will likely receive an average of $5.50 worth of Valentine’s Day presents. 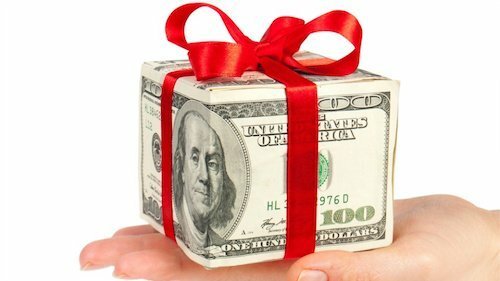 Instead of overspending on gifts, consider alternative options. Giving the gift of an experience is one idea that comes to mind. Think about taking your loved one out for a relatively inexpensive dinner or to a movie. You can always treat your significant other or spouse to a special home-cooked meal or exchange customized homemade gifts. After all, gifts like these tend to be more meaningful and require a lot less cash than your average $182,550 teddy bear.